Give your guests the comfort of seating and shade with this 10'x20' Tent and 3 Picnic Tables Rental Package! This Tent & Table package is perfect for seating 20-25 adults comfortably. This tent comes in many different shade configurations making it perfect for any outdoor event, from graduation parties to backyard events. These tents can easily be combined into L-Shaped (2 tents) or U-Shaped (3 tents) configurations in order to fit your event area. - Side Shades. This option provides 20' of adjustable shades that are approximately 1/3 the height of the tent legs. Simply slide the shades up or down as needed for the time of day. - Full Curtain Walls. This option provides the most flexibility when it comes to protecting your guests from the elements. Simply zip and unzip the walls as needed. Setup: Picnic tables will be place under the tent unless otherwise instructed. To secure tents to the ground, we will use stakes for grass surfaces and sandbags for hardtop/indoor surfaces. You will be prompted to make a surface selection after you have added the item to the cart. Looking for even more entertainment for those hot summer days? Check out our "Splash" category for an extensive selection of water slides and water slide bounce house combos! 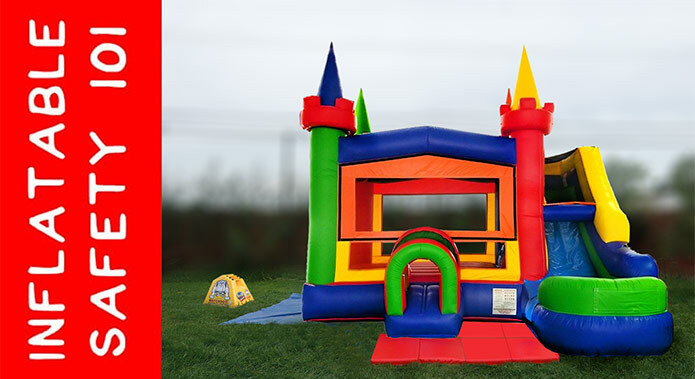 We also have many other inflatable dry slides and bounce house slide combos in our "Slide" category! Oh, and don't forget to check out our outdoor and indoor games as well as our Cotton Candy, Snow Cone, and Popcorn Machine Rentals, too!